Story and Photos by Jacqueline Harmon-Butler. The proprietor pointed to a small jar among the selection of bottled spreads displayed in front of me. “Pesto al Pistacchio di Bronte,” he read from the label. “Yumm,” I replied. He then prepared another chunk of bread for me. This time he chose “Crema di Capperi.” The sharp bite of the capers and peperoncino were mellowed in the richness of the extra virgin olive oil. He did not stop his preparations until I had tasted the “Pate’ di Olive Nere,” rich black olives ground to a paste with basil, peperoncino and extra virgin olive oil; the “Crema di Melanzane,” a smooth spread of eggplant; followed by the “Pate’ di Pomodoro,” which tasted of the sun-filled countryside, laced with garlic and basil; and finally the “Crema di Carciofi,” artichokes creamed with extra virgin olive oil. My Italian is very limited, but I managed to understand that all these spreads were produced locally. Enrico, the shop owner, went on to explain the many uses for these little treasures. Not only could they be spread on bread or crackers, but also would become a “volcanic explosion” of flavor when added to hot pasta. Delighted with his description, I chose a variety of the small jars. Just beyond Acireale, the bus turned away from the sea and began the long ascent up the twisting, tortured road that winds up the slope of Mount Etna. I saw masses of prickly pears, groves of oak, chestnut, hazelnut and pistachio trees, and forests of birch and pine, cut through in places by long ebony fingers of cooled lava. Dotted here and there were vineyards, lemon and orange groves, their lush foliage sharply contrasting with the devastation of the lava streams. Now and then the ruins of a home or church would poke up through the cooled magma. I was amazed to find small islands of trees, whose roots had somehow survived the fiery inferno, growing up through the lava beds. I wandered over to a string of gift shops that dotted the edge of the parking area. There was the usual array of tawdry tourist trinkets: picture postcards, black lava rock Madonnas with blue glittery robes, black lava rock beads strung into necklaces, bracelets and dangling ear rings and key chains; an assortment of t-shirts, cooking aprons, ashtrays and commemorative plates. I took my time looking at each item, marveling that people actually buy miniature black lava rock volcanoes with glittery red lava flowing from their tops. 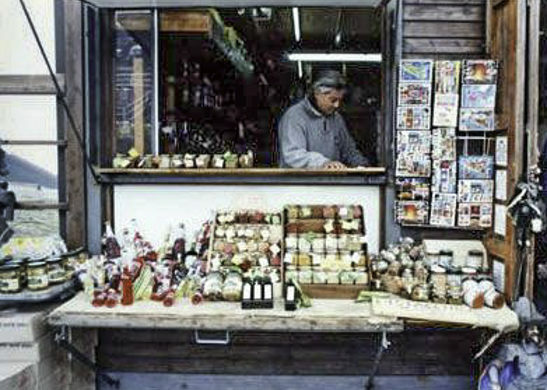 The Antico Souvenir is the last shop along the strand. Dark green bottles of extra virgin olive oil caught my eye. Enrico told me it was produced in nearby Nicolosi as he opened a bottle and poured a small amount of oil into his hand. He then rubbed his hands together and in an amazingly short time, the oil was completely absorbed. “Very special,” he explained. “Extra Virgin,” he added with a grin. Of course I had to add a bottle of this local delicacy to my growing stack of goodies. 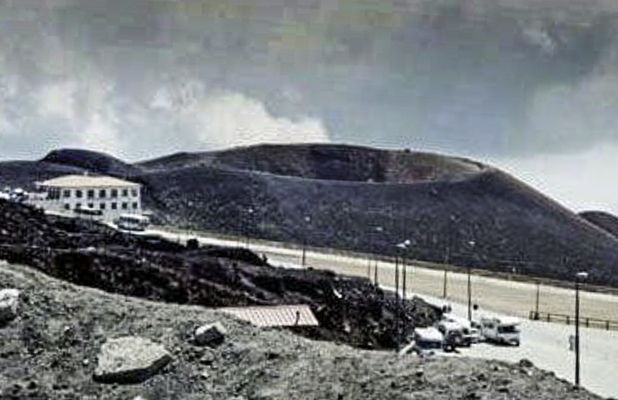 Nearby was a display of “Fuoco dell’ Etna” –– firewater from Etna, an alcoholic beverage named after the volcano. Naturally, Enrico insisted I taste it. “Whew!” I nearly choked on the bright red liquid. My throat felt like it was on fire and I could feel the burn all the way down into my stomach. For the first time all day I was warm. Two glistening scarlet bottles were added to my stash. Another of your sensual beautifully-written stories, Jacqueline. It was a delight to read. I love this story. It took me right to the places where I long to travel ? Well written story so descriptive.